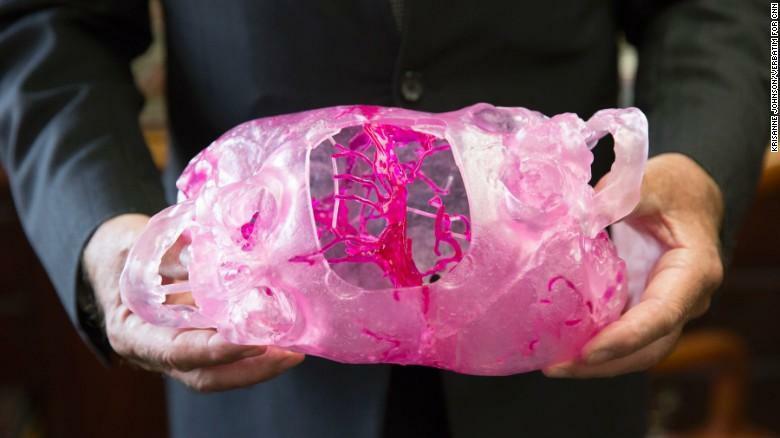 Three years ago, Dr. Bon Verweij was the first surgeon to perform a full skull replacement transplant using a 3D model. His patient, a 22-year-old woman diagnosed with a rare cranial disease, now lives a healthy life with few, if any, lingering symptoms. Dr. Bon Verwiej with the 3D model of his patient's skull (Source). Dr. Bon Verwiej believes that 3D technology offers the answers to reconstructive surgery's most complex questions. Before 3D models, surgeons had to rely on photographs and other forms of 2D imaging to plan and execute a procedure. With 3D technology, however, physicians can clear up any confusion about patient anatomy and plan their strategies for surgery before entering the operating room. Rhinoplasty using forehead flaps: This surgery can be tricky because it requires precise measurements and can lead to infection or vascular complications. 3D models help surgeons cut perfectly measured flaps and analyze tissue composition to avoid infection and vascular problems. Conjoined twin separation: Potentially one of the field's most invasive and precarious procedures, conjoined twin separation can result in the death of one or both twins. 3D models help surgeons plan for and execute twin separation, many of whom are conjoined by vital organs. Below, we'll break down how 3D models are addressing surgeon's most pressing questions about these complicated procedures and helping them provide care never before possible. 3D technology is improving the surgical practice of rhinoplasty using forehead flaps, a procedure with a dense and somewhat unsettling history. The first documentation of forehead flaps occurred in the Sushruta Samita, an Indian medical document written over 14 centuries ago. A guide to treat those punished with nasal amputation (an accepted penalty for particularly heinous crimes), this document details how to use a section of the forehead to reconstruct the nose. Today, nasal reconstructions are one of the most common plastic surgery procedures. Surgeons perform nasal reconstruction for a number of reasons, treating those who have experienced trauma to the nose to those born with defects that make breathing difficult or impossible. Surgeons use forehead flaps to perform these reconstructive surgeries because skin from the forehead closely resembles nasal tissue and provides far more accurate results than any other approach to nasal reconstruction. Ensuring these high-quality results starts with a well-planned and executed procedure. Below, we walk you through the process. The procedure is by far the most important step in guaranteeing the patient a functional and attractive reconstruction. There are two parts to a procedure that uses forehead flaps to reconstruct the nose: wound assessment and surgery. Wound assessment: Before performing surgery, the physician needs to assess the patient's nose for several key features, including vascularity, skin loss or removal, and measurements of donor tissue. This information will help the surgeon best identify a donor site on the forehead, make incisions with appropriate measurements, and cut the skin down to an appropriate width to complement the nose aesthetically. Surgery: Once the surgeon has performed a wound assessment, he or she will begin by drawing an outline of the donor site. Once this outline is made, the surgeon will make an incision on the forehead, elevate the donor site, and flip the flap to cover the part of the nose requiring tissue coverage. Once this flip has been made, the surgeon will sew the flap to the nose, stitch forehead incisions back together, and treat the remaining forehead wound with gauze so that it can properly heal. Once this initial surgery has been performed, the patient will undergo several more, all of which are separated by a few weeks of recovery. These remaining surgeries are meant to contour the nose and make sure that it has the most realistic shape possible. Throughout planning and executing the procedure, the surgeon will need to anticipate a few key potential complications. These common complications can lead to patient dissatisfaction and, in rare cases, nasal disfunction. Flap mismeasurement: Historically, surgeons relied on measurement estimates to ensure that forehead flaps fit perfectly over the area of nasal reconstruction. Although uncommon, this strategy can lead to imperfect forehead flap outlines that fail to adequately cover the nose. Vascular complications: The two most common forms of vascular complications are arterial and venous events. If arterial veins are functioning incorrectly after the forehead flap has been stitched onto the nose, the flap will appear pale and will be cool to the touch. If venous veins are functioning poorly, the forehead flap will appear dark purple and will feel warm due to blood clotting. Scarring: One of the most common patient concerns from the surgery is scarring. Although rare, scarring from the forehead through the nose can occur depending on facial topography and magnitude of the reconstruction. Imperfect contouring: Once the flap has been grafted onto the nose, the surgeon must reshape the graft to resemble a realistic/aesthetically pleasing nose. This shaping process can be particularly complicated if the surgeon does not have a model to reference during surgery. These complications can be anticipated and even avoided with the help of 3D models. The models offer an excellent resource to anticipate and avoid surgery complications because they help the surgeon plan for and execute the rhinoplasty procedure. The models are useful in part because they are made to look exactly like the nose post-surgery. The guides are created through a meticulous process that begins with scanning the patient's nose, altering the measurements from the scan to reflect the post-op nose, and finally printing out the nose. The surgeon uses the 3D model to ensure high-quality contouring during surgery. These models are invaluable to nasal reconstruction because they minimize surgery complications. They ensure access to highly accurate simulations of surgical results so that physicians better plan and execute surgery. This means that surgeons have a better sense of forehead incision measurements, grafting techniques, and contouring precision. It also means that patients leave the operating room with a fully functional and realistic nose. The use of 3D models for nasal reconstruction with forehead flaps is growing more and more common. However, 3D models can be just as useful for extremely rare-use cases, as well. For example, 3D models can help surgeons better plan for conjoined twin separation, execute the procedure, and ensure high-quality treatment, just as they do in the nasal reconstruction procedure. Conjoined twins are born in approximately 1 in 200,000 live births every year. Only 35% of those born alive will survive for longer than 24 hours. Those who make it past the first day only have between a 5% and 25% chance of surviving long term. Conjoined twin survival rate is so low because the babies often share vital organs. If the twins are not separated, their shared organs can function poorly or shut-down altogether. Historically, conjoined twin separation didn't always offer patients a greater chance at survival. That's because the procedure is remarkably complex and often requires surgeons to separate vital organs—including the brain and heart— into two separate bodies. 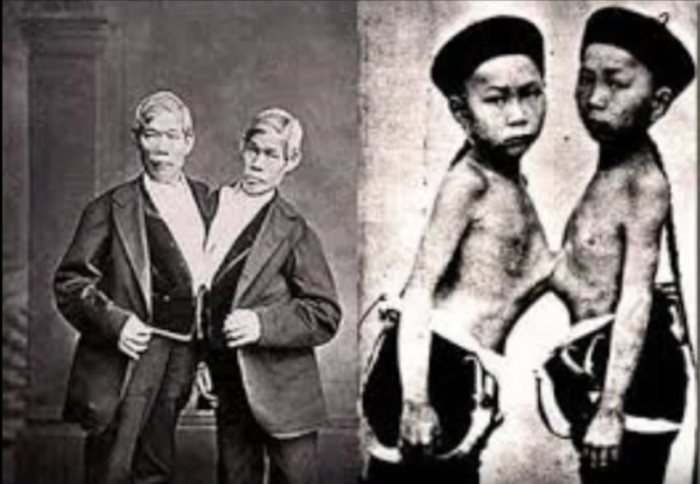 Chang and Eng, two of the most famous conjoined twins, were the namesake of the term Siamese twins. They were lucky enough to survive into adulthood (Source). Fortunately, 3D models are simplifying this risky surgery and giving patients a better chance at life. Just like the rhinoplasty procedure, this begins with meticulous planning. This planning and execution can vary drastically depending on the surgery required for separation. Depending on where the twins are fused, they will require customized and well-thought-out surgical strategies. Once surgeons have identified the pertinent procedure, they'll go through a thorough planning period to determine the safest incision pathways. When the planning period is over, they'll perform surgery over the course of several hours, with some of the longest surgeries taking over a day to complete. Conjoined twin separation presents the patients' family members with a host of ethical dilemmas. Perhaps most important are the dilemmas that require parents and their families to make the life-and-death decisions of their conjoined children. Especially when concerning twins with heavy organic overlap, parents are faced with the prospect of poor surgical outcomes and, in the small chance of success, an expectation that only one of their children will survive. This means that parents must decide not only to expose their children to a risky surgery, but also to a surgery that might result in the death of one of their twins. Only 250 of all conjoined twin separations have been successful. This means that at least one of the two twins survived into old age. If we measure success by the long-term survival of both twins, the numbers get even more grim. There are many reasons why success rates are so low, and one major contributor is surgical complexity. This complexity differs on a case-to-case basis, but can present a barrier to survival as soon as the twins enter the operating room. The anesthesia used to sedate patients is commonly cited as one of the key contributors to surgery complications. That's because the twins' responses to the anesthesia and any errors in dosage can lead to blood clots, intracranial bleeding, heart complications, and infections. Surgeons must also be prepared to confront physiological irregularities including intestinal and genitourinary malformations. Discovering these physical abnormalities during surgery while managing responses to anesthesia can prove difficult and at times deadly for the twins. In order to ensure high-quality treatment for conjoined twins, surgeons must understand how they are conjoined from multiple vantage points. That means that they need to collaborate with and sometimes delegate to a team with vastly different specialties and knowledge. This can sometimes create barriers in communication or even disagreements about surgery priorities. Lead surgeons will have to navigate any potential disagreements and ensure that the plan for surgery is clear and implementable for everyone. These few examples of complications and dilemmas offer a bird's eye view into why conjoined twin separation is so difficult—and it's potential for improvement. 3D models offer a means for this improvement. That's because they help surgeons ease the discomfort of ethical ambiguities, address procedure complexity, and better manage a team of diverse healthcare providers. They remove a lot of the risk and ambiguity involved in high-risk conjoined twin separations. Below, we offer one example how. Last year, Anias and Jaden McDonald were born conjoined at the head. In order to live healthy, separate lives, they required a cephalopagus separation. Jaden & Anias before surgery. Dr. James Goodrich, the boys' surgeon, was able to separate the boys with the help of a 3D guide that mimicked their fused skulls and neurological tissue. Using the guide, Goodrich and his team simulated the separation before surgery and determined an incision pathway that avoided vital veins and reduced neurological damage. Because Goodrich had access to this highly accurate model before surgery, he was better able to understand and plan to separate the boys' neurological tissue, assure Jaden and Anias's parents that they would survive the surgery, anticipate and address intraoperative complications, and assign appropriate operative roles for the entire surgical team. The surgery was a success. Thanks to 3D technology and a highly committed surgical team, the boys are celebrating their second birthday this year. More importantly, they both now have a shot at living healthy, happy, and separate lives. We can now return to Dr. Verweij's claim that 3D technology transforms surgery. This claim can hold different meanings for those involved—surgeons, patients, and families alike. What binds these meanings together, however, is that they reflect the desire for a new, improved chance at life. 3D technology addresses this desire, and delivers hope to a field long awaiting solutions to seemingly unanswerable questions. The 3D model of the boys' conjoined brain (Source).